Shock Waves produce QED radiation - not high Temperatures ! PITTSBURGH - Aug. 6, 2015 - PRLog -- . Since the 1940 s, physicists and chemists have been captivated  by how shock waves can heat gases to several thousands of degrees in the time scale of a few molecular collisions with the thermal transfer of energy in the temperature range 1000 to 10,000 K. Indeed, shock waves have been long thought to be a convenient experimental method to study the response of gas molecules at high temperatures. However, the high temperatures could not be directly confirmed by measurement because sensors cannot be placed inside the infinitesimally thin shock thickness. Instead, gas temperatures were inferred from spectroscopic analysis of the frequency of EM radiation emitted from specific molecules assuming the molecules are in fact thermally excited. EM stands for electromagnetic. Today after about 75 years, nothing has changed: direct measurements of shock wave temperatures are still not possible leaving spectroscopy as the only way to infer the temperature of the shock wave. Although spectroscopy has improved inferred gas temperature measurement, claims of high accuracy in shock wave temperatures may not be valid if the molecules are not thermally excited, such as claims  of measurements of shock wave temperatures to an accuracy of 6 K over a range from 700-1200 K using the vibrational states  of the CO2 molecule near 4.2 μm. Generally, it is thought when a disturbance moves so fast that gas molecules cannot move out of the way, the molecules move closer together and compress to nanoscale shock thicknesses. Based on classical physics, shock wave compression produces high pressure resulting in a sharp rise in temperature, the derivation of which is routinely performed by university students. 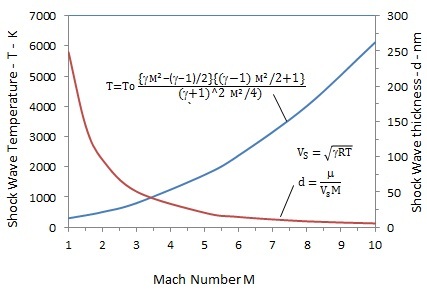 For ideal diatomic gases  initially at ambient temperature To = 300 K having specific heat ratio γ = 7/5, the thumbnail shows the shock wave temperature T at Mach 10 is about 6500 K, although monatomic gases produce temperatures near 10,000 K. For air as a diatomic gas having viscosity μ = 1.6x10-6 m2/s, the corresponding shock wave thickness  is about 6 nm. What is the ionization mechanism by which the gases are excited? The work of compressing the gas in the nanoscale shock thickness is conserved by the emission of non-thermal QED induced EM radiation. QED stands for quantum electrodynamics. QED is a consequence of QM that denies atoms the heat capacity to conserve absorbed EM energy of any kind by an increase in temperature. Instead, the work of gas compression is conserved by frequency up-conversion to the standing wave EM resonance of the shock thickness. For nanoscale shock thicknesses, the QED radiation created in the UV and beyond is sufficient to ionize gas atoms and molecules. UV stands for ultraviolet. See diverse QED applications at http://www.nanoqed.org/, 2010 – 2015. In the shock wave, the work of gas compression is confined almost totally in the surfaces of the nanoscale shock wave thickness because of its high surface to volume ratio. For shock thickness d, atoms between the surfaces are placed under temporary EM confinement by the high surface energy. Since the temperature cannot increase by QM, QED conserves the surface energy by creating standing EM waves having half-wavelength λ/2 = d within the shock thickness. Hence, the QED induced standing wave behaves as if it were absorbed EM radiation from an external source. Because of the nanoscale shock thickness d, the QED radiation wavelengths λ have sufficient Planck energy E = hν to exceed the ionization potential of atoms and molecules in the shock thickness, where h is Planck’s constant and ν is frequency. Here, ν = (c/n)/λ = c/2nd, where c is the velocity of light and n the refractive index of the compressed gases. In applying QED radiation to the shock wave thickness, the refractive index n of the compressed gases may be estimated from the Gladstone-Dale relation, i.e., n = 1 + K’ρ. For air in the UV, K’ = 0.233 cm3/ Kg and taking an upper bound density ρ = 10 x density at atmospheric pressure = 12.75 Kg/m3, the refractive index n ≈ 1 remains near unity. By QED, the shock wave thickness d may be estimated by experimentally measuring the wavelength λ of QED radiation in the UV coming off the shock wave, i.e., d ≈ λ/2. For example, QED radiation in the UV at λ = 200 nm suggests a shock wave thickness d = 100 nm. But QED radiation in the EUV, say at λ = 50 nm corresponding to d = 25 nm may be difficult. EUV stands for extreme ultraviolet. Unlike UV, EUV is immediately absorbed in air at the shock thickness surface and cannot be measured at any distance removed from the shock wave. Classical physics as the traditional method for estimating shock wave temperature is not valid to derive nanoscale shock wave thicknesses. QM governs the nanoscale – not classical physics. QM suggests high shock wave temperatures do not exist as the compressed atoms in nanoscale shock thicknesses lack the heat capacity to conserve the work of gas compression by an increase in temperature. Shock wave spectra are not thermally excited, but rather excited by non-thermal QED induced UV and EUV radiation. Inferring gas temperatures from the spectra of specific molecules therefore is simply not valid. Claims that gas temperatures may be accurately inferred from spectroscopic measurements are highly questionable. QED conserves the work of gas compression by inducing the emission of non-thermal EM radiation. Typically, the QED radiation emitted in the UV and EUV is sufficient to exceed the ionization potential of any shock gas. By measuring the wavelength of emitted QED radiation, the thickness of the shock wave to may be estimated as half of the QED wavelength. I. R. Hurle, “Chemico-physical processes in shock waves,” Rep. Prog. Phys. 30 149, 1967. K. Wu, et al., “Sensitive detection of CO2 concentration and temperature for hot gases using quantum-cascade laser absorption spectroscopy near 4.2 m ,” Appl. Phys. B, Lasers and Optics, 5880-4, 2014. R. A. Granger, Fluid Mechanics, Dover Publications, New York, 1995. Galaxies: Flat rotation curves a sign of dark matter or cosmic dust? Existence of dark matter depends on cosmic dust, not the shape of rotation curves! Dark Matter: It's the redshift in cosmic dust! Simple QED: An alternative to Feynman's QED?